EB5 Affiliate Network (“EB5AN”) and Arnstein & Lehr, LLP (“Arnstein & Lehr”) have jointly developed an Automated Subscription Agreement for EB-5 regional centers that saves time and money and minimizes errors in the EB-5 project subscription process. 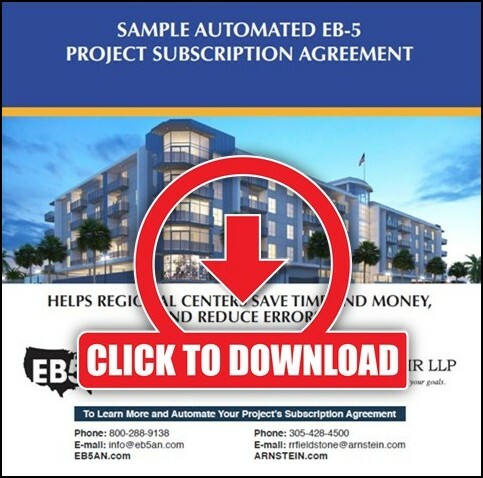 The Automated Subscription Agreement allows investors to efficiently complete the EB-5 project subscription agreement by entering in two (2) pages of personal data, which auto-fills fields throughout the remaining 20+ pages of the agreement, drastically reducing the time required to complete the agreement and minimizing the potential for errors. Similar to the assumptions page of a traditional financial model, blue colored text indicates data fields that need to be entered by the investor. Entered data then automatically populates the entire agreement, easily and correctly completing all required fields. Additionally, all areas requiring signatures or initials are clearly marked with red arrows. By eliminating the need to fill out a lengthy legal document by hand, entering the same information on multiple pages with different prompts, the Automated Subscription Agreement saves time and reduces the likelihood of errors that result in a costly back-and-forth between the regional center, the agent or broker, and the EB-5 investor. Jointly developed with Arnstein & Lehr, the Automated Subscription Agreement was created by coding and reprogramming all of the required forms in a traditional EB-5 subscription agreement while fully integrating the NES Financial Subscriber Worksheet as well as current copies of IRS Forms W-8BEN and W-9.